Gova Shevai is a very popular sun dried item.I had already posted in one of my posts- Shevai usli about the sun dried wheat noodles. Making these noodles requires lot of effort but the output is worthy. 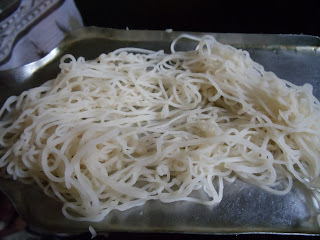 Making these noodles is a 7-8 days process and I remember my amma making them and me help her with it, in my school days! Now the number of people making it has decreased. Now people buy the ones available readily in the stores. Posting the procedure of this noodles was my long time dream. Never thought I will post it so soon! All the credit goes to my Mother in law. She was the one who made this and I was happily clicking the photos. She likes making it every year and use them through out the year. I have tried to capture each step and have tried to explain as much as possible. Hope this helps and motivates few of you to try this! You will also need big plastic sheets (for drying the noodles) and big flattened boxes, to support the plastic sheets. Wash and soak wheat for two days. 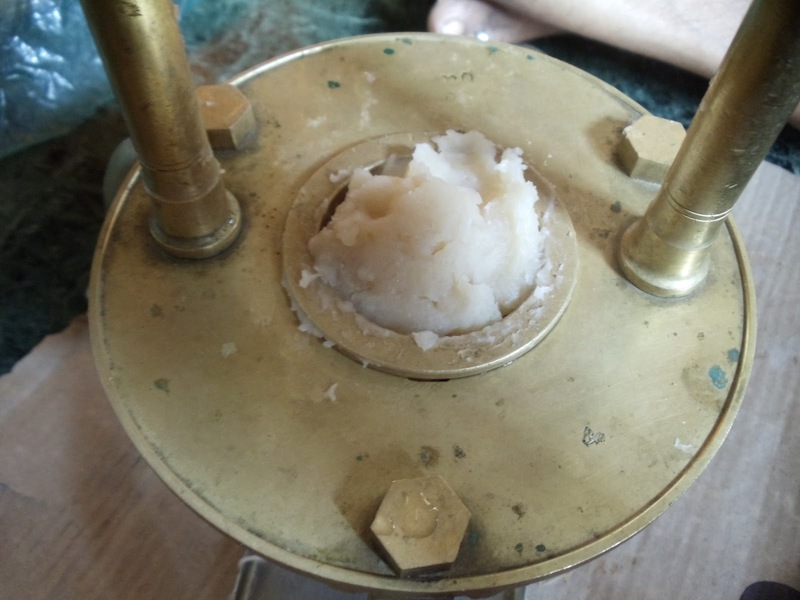 Wash it again with generous amount of water, 7-8 times to remove the bad smell. 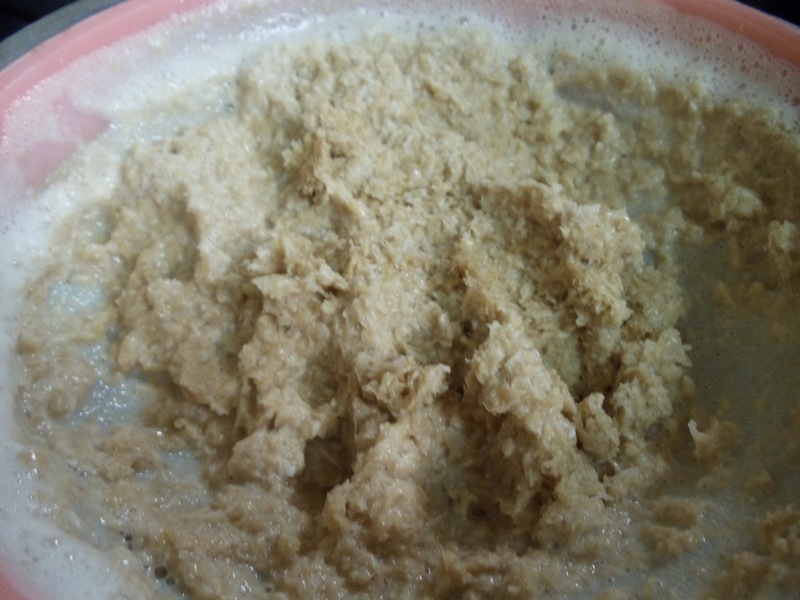 Now grind the soaked wheat in a grinder (preferred) or a mixer grinder to get a paste, adding sufficient amount of water (the paste will not turn out fine and don't worry if it becomes watery). 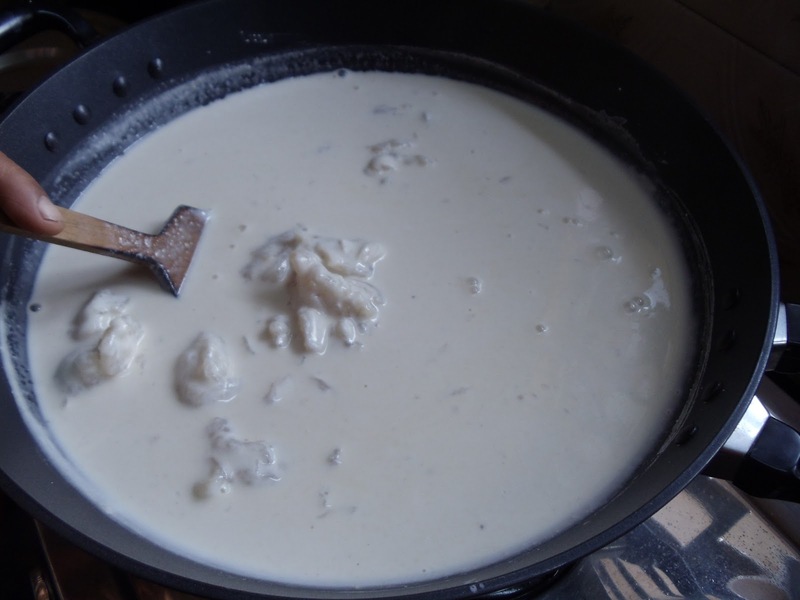 Transfer the watery paste into a bowl. Now take a very big container like a stock pot or any other big dish you have in hand. The extracted milk has to be stored in this. Then take another container and a big strainer (you can also use a muslin cloth) to extract milk (like) from the ground wheat. 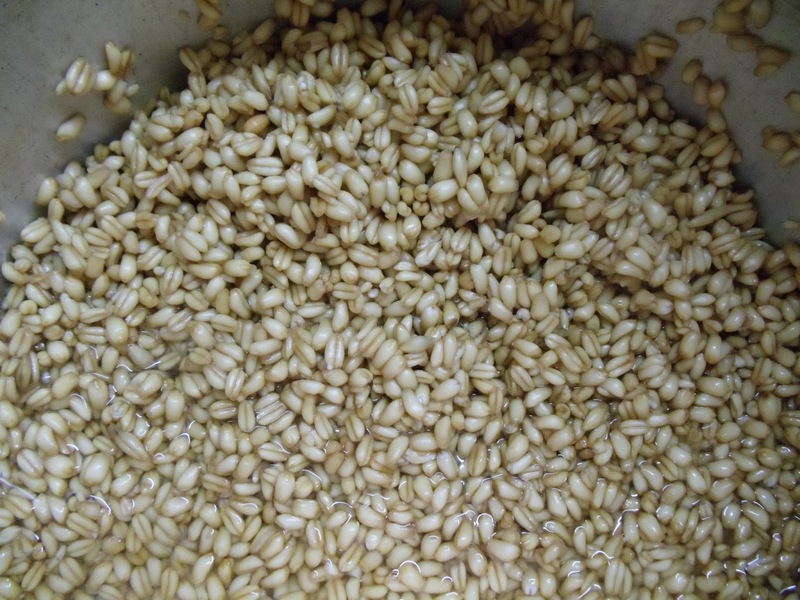 Step 1: Start pouring the ground wheat in batches. Once the strainer is full, stir the mixture using hand. 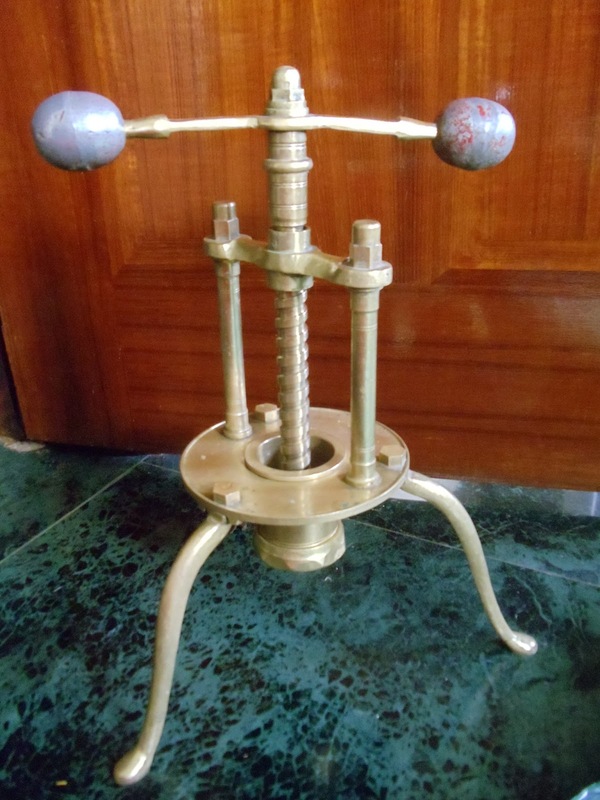 This will fasten the process of the extraction of milk from wheat. Once the white liquid drains completely, you will be left with the wheat residue. Don't throw the residue at this point. Collect it in a big bowl. 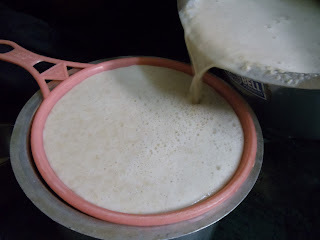 Also transfer the extracted milk of wheat to the big dish. Now add the next batch of the ground wheat to the strainer and repeat Step 1 until everything gets over. 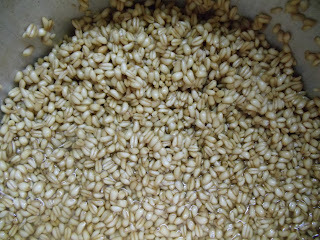 Then add generous amount of water to the wheat residue and mix well. Repeat step 1 and again extract the milk. Now the white liquid extracted is little dilute than the first batch. In this way Step 1 has to be repeated 3-4 times, until all the milk from wheat is extracted. 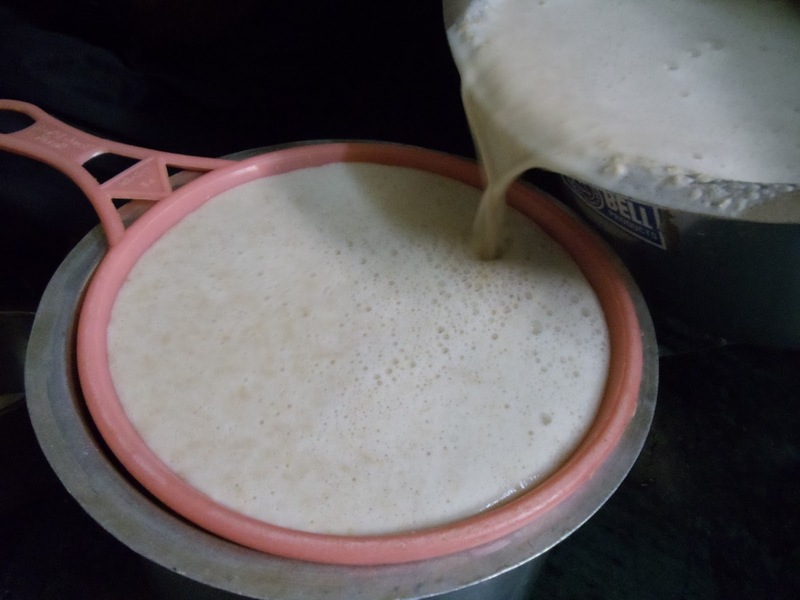 The milk extracted from wheat ( thick as well as dilute) is taken together in the big dish. 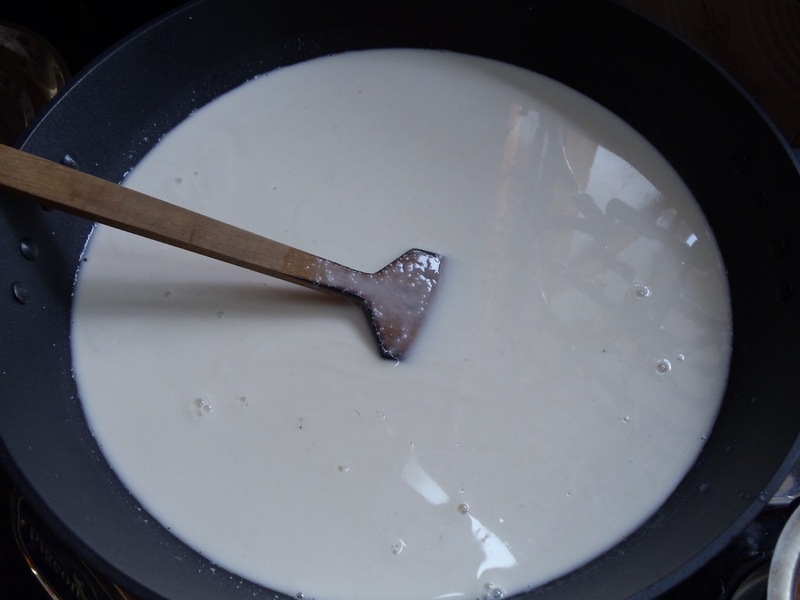 Allow the milk to settle for 8-10 hours (generally over night). After 10 hours the thick paste of wheat settles at the bottom and the top layer is water. We want just the settled thick wheat paste and hence the top layer (water) is unwanted. Without much disturbance, the the water has to be discarded by slowly bending it near a sink. 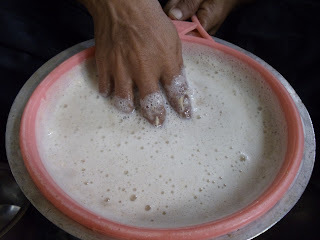 once the water is thrown completely, transfer the white paste to a kadai (non stick works good. If you are not using non stick then grease the kadai with little oil). Add salt to taste. Now start heating it on a medium flame and stir it continuously. After few minutes, the liquid starts to solidify. Continue stirring continuously until the whole mixture solidifies and forms a single mass. Turn off the heat. Now the mixture is ready to make noodles (it has to be done when hot. The mixture hardens as it cools). I used the traditional noodles maker. Step 2: Put little mixture in the mould. Make small noodles and collect them on a plate. Spread them on a greased plastic sheet. Repeat step 2 until all the mixture is used up. 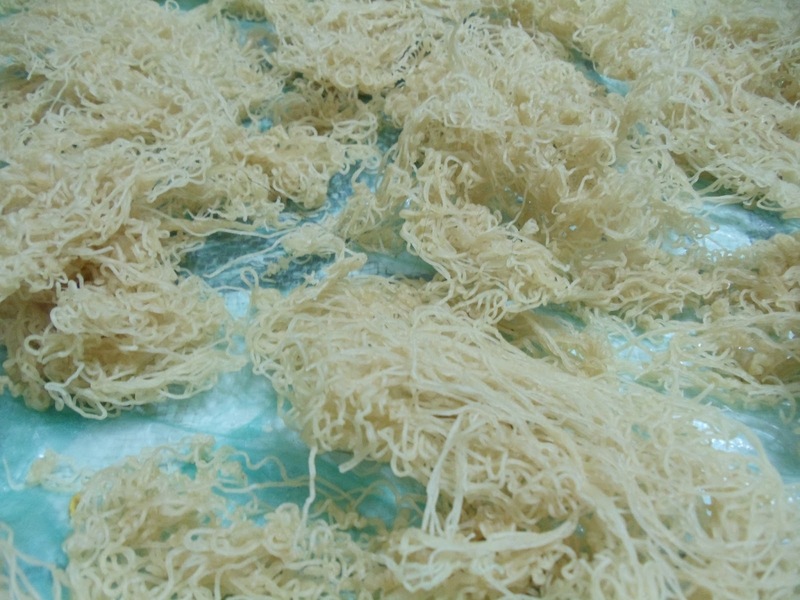 Dry these noodles under sunlight for 4-5 days. Store it in a air tight container. It can be used for more than a year. 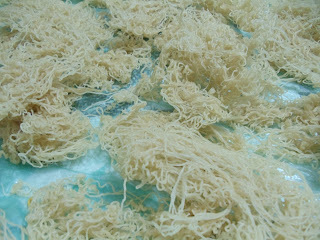 These noodles are used to make Shevai Usli. It can also be deep fried. 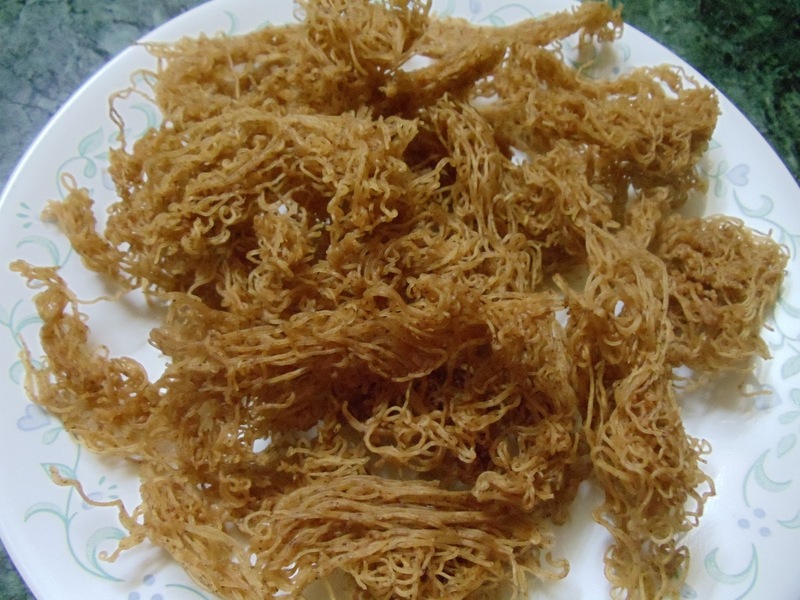 Note: You can as well make Sun dried Ragi noodles. The whole procedure remains the same. Just substitute half of the wheat with ragi i.e 1/2 kg of wheat and 1/2 kg of ragi. The resulting noodles looks like this. Outstanding! 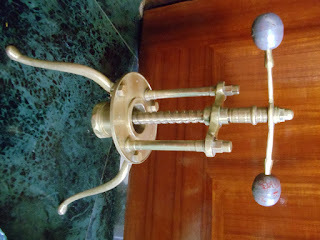 And also loved the noodles maker - looks like one of those that is passed through many generations. It is a lot of effort but so worth having home-made shevai...great post! Thank you so much for the encouraging words Vinita. Even i liked the noodles maker:-) Its not old though. MIL bought it few years back. Why can't we make it with wheat flour? If we can, what alterations do you suggest? Hi Ashok, Sorry for the delayed reply. 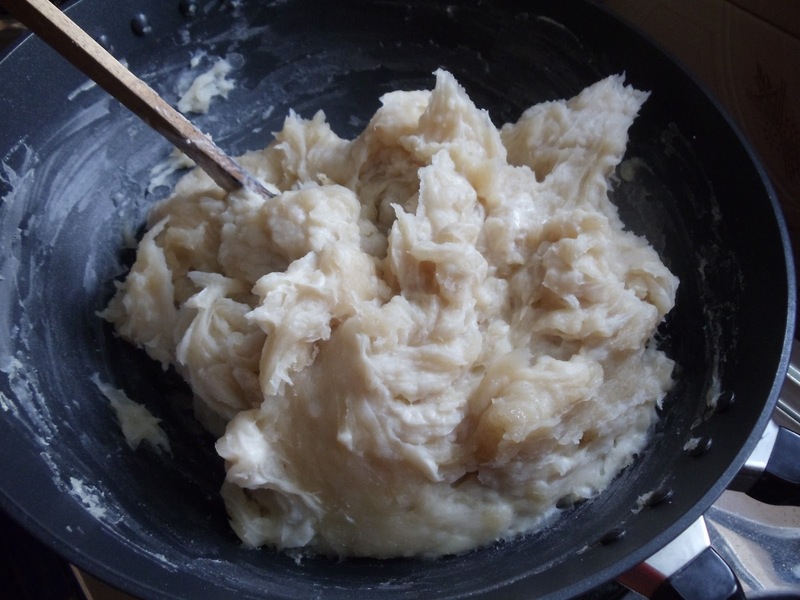 My MIL never made shevai using wheat flour. So personally I don't know if it works. Sorry about that. I searched the net everywhere and just when I was about to give up I saw this post. Thanks for documenting this age old procedure. 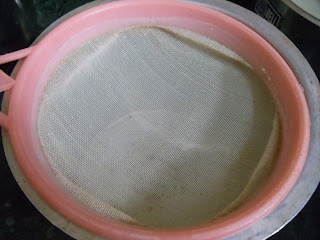 Hi Manjula... Is there a way to make this without drying in the sun? May be steam it after shaping it into noodles or steaming the dough and then shaping into noodles(like rice shevai)?